Feeding families one bag at a time. The Nutrition on Wheels program will provide a large truck full of fresh meat, cheese, produce, and whole grains to families who qualify TODAY from 4 – 6 p.m. at the Habitat for Safe Seniors, 2174 Old Sattler Road. There will be enough food for 300 families … first come first served. Fifty pounds per family! Please arrive at the Senior Center between 4 p.m. and 5:45 p.m. (truck will leave at 6 p.m.). You will receive your groceries from the truck. Please make plans to have enough room in your vehicle for the items and remember that some items are perishable. Please fill out the voucher available at the Startzville Front Office, or they will be available on site. 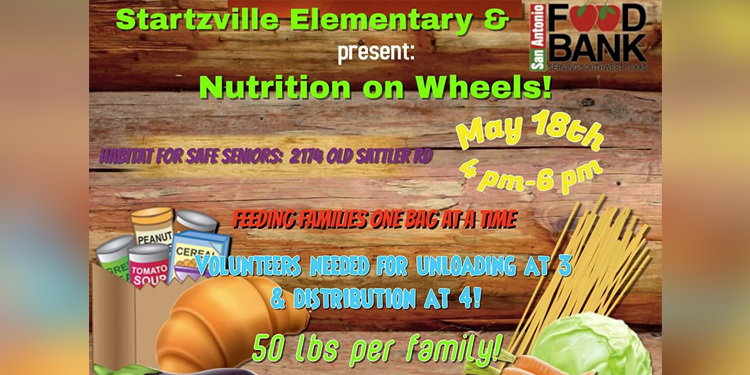 Volunteers are needed for unloading at 3 p.m. and distribution at 4 p.m.
For more information, contact Cate Kelly, STZES CIS coordinator, 830-885-8010, amanda.kelly@comalisd.org.